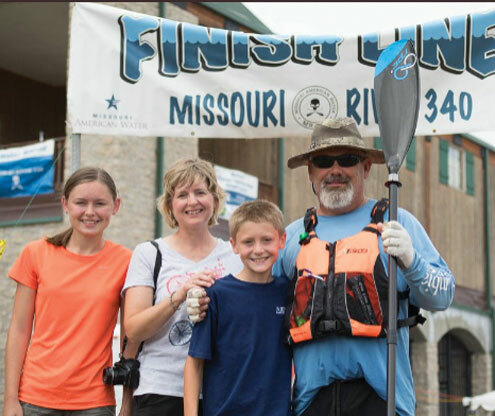 Pike County native LaDon Atkinson participated in the 12th Annual Missouri River 340 race Aug.8-11. The MR340 is the longest non-stop river race in the world, covering 340 miles of the Missouri River. Racers enter the starting point at Kaw Point, Kansas City, Kansas, and finish the race at St. Charles, Missouri. The MR340 raises awareness for clean rivers and money raised benefits Missouri River relief projects. Currently, half of Missouri receives their drinking water from the Missouri river. Sign-up for the race started at midnight on New Year’s Eve. Total boats signing up in the 11 different men, women, and team divisions totaled 450. Atkinson raced a 16 ft. Wilderness Tsunami 165 kayak in the Men’s Solo division, which accounted for 250 of the 450 total boats registered. Racers had 88 hours to complete the MR340, with checkpoints located at six locations along the river: Lexington, Waverly, Glasgow, Jefferson City, Hermann, and Klondike. Atkinson finished 87th in his division with a final finish time of 77 hours and 42 minutes. Ground crew support was provided by his wife, Patricia, and children, Lizabeth and Levi. Ground crews met racers at the various checkpoints, providing food, water, and any other necessary supplies to the racers. Support also came from Atkinson’s employer, Alliance Water Resources, by providing safety equipment and encouragement. Family and friends tracked the race online and encouraged with social media posts.